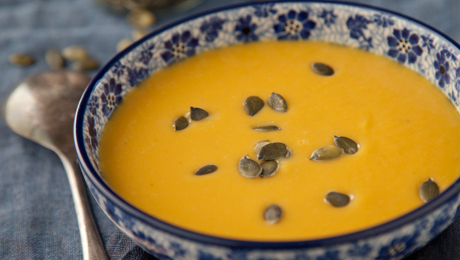 This tasty and thrifty, seasonal pumpkin soup is full of flavour. Place the pumpkin seeds on a baking tray and cook in the oven for 8 to 10 minutes, until toasted. Remove from the oven and sprinkle with the chilli flakes and salt. Meanwhile, heat the sunflower oil in a large saucepan set over a medium heat. Add the onions and garlic and cook for 3 to 4 minutes, until softened. Add the pumpkin and crumble in the stock cubes, then pour in the water. Bring to the boil, then reduce the heat and simmer for 15 minutes, until the pumpkin is tender. Blend the soup until smooth and season to taste with salt and pepper. Ladle the soup into warmed bowls, sprinkle with the pumpkin seeds and serve.